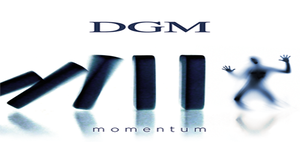 DGM is a well-known Italian Progressive Power Metal band that was founded almost 20 years ago. It is interesting that there are no original members in the band now and only the name is left (which stands for an abbreviation of the first letters of founding members). Since then the band have successfully recorded 7 full-length albums in the same vein with acts such as the famous Symphony X. So it is not surprising that lead singer of Symphony X Russell Allen helped them during the recordings of the band’s upcoming 8th album “Momentum” that will be released on 26th of March on Scarlet Records.If you’re a proghead then you won’t be let down a bit as these guys totally rip through the whole set with a dazzling display of power and intrinsic playing as we come costumed to hearing from them in the past. The album follows a simple formula where odd-numbered fast tracks are changed with even-numbered mid-tempo songs and vice-versa except 2 last tracks “Void” and “Blame”. I like the positive (but not too happy) mood of the most tracks, it creates a good impression and I listened to this with a great pleasure. I also enjoyed very much the shredding guitar-keys solos which actually remind me those of Romeo-Pinella (which in their turn were influenced by Yngwie Malmsteen). However DGM is not a clone of Symphony X. The musicians almost minimize the use of sympho-elements in the music but concentrate more on bright melodies. The music is not ultra-technical or unnecessary complicated but it is complex enough for Progressive Metal and many Power Metal elements fit well here. Some moments are comparable with Galneryus though DGM is more technical and progressive than this Japan ensemble. Flashes could also be found with Dutch band Elegy, especially vocal lines of Mark Basile who reminds me of Ian Parry. It is worth saying that not only the lead singer does a great job here but all members of the band demonstrate their high class skilled musicianship. There are no weak tracks on the album but I prefer all up-tempo tracks and especially Reason (where Russel Allen makes a good guest performance), “Universe”, “Chaos” (where guitar solos were performed by Norwegian guitar virtuoso Jorn Viggo Lofstad from Pagan’s Mind), “Overload” and “Void”. More tracks leave an impact as well. “Trust” is a very nice melodic song with catchy choruses; “Repay” seems to be a traditional ballad after the calm piano beginning but it surprisingly turns into powerful song. So “Momentum” is the logical successor of the previous works of DGM. This is a very strong release with only some minor flaws. For example some numbers could be more variable and different but it is just my personal preferences. Nevertheless it is strictly recommended for all fans of Progressive Power and Melodic Metal a must have!! !